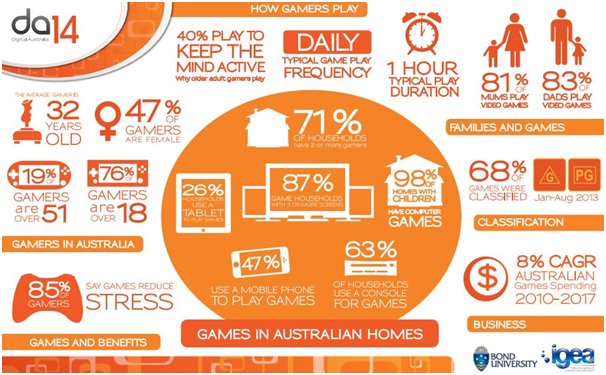 The Australian Interactive Games & Entertainment Association (iGEA) has just released its latest annual “Digital Australia” report analysing our nation’s gaming habits. And without any surprises, it came to the conclusion that we Aussies love computer games. However, there are some nice little surprises in there that should get our minds percolating and salivating at the same time. And here is an interesting one – about 25% of gamers have spent money on gaming merchandise such as clothing, toys, posters, etc. There is a plethora of statistical goodness in the report, and plenty of other surprises as well. And they also included a nice little infographic for us to enjoy. But one thing is clear – we Australians love computer games, and more of us are falling in love with them as time goes on. Games became a norm for us, and they are a huge part of our culture. So the only thing left is to grab a pad, load a game, and have some fun – I’ll see you on the other end! If you want to access the report, you can do so by heading over to the iGEA site.